Info "Get the alien on the UFO before it misses its flight." Alien Abduction is one of WarioWatch's microgames in WarioWare: Twisted! 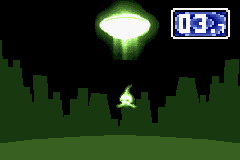 The game starts with an alien on the ground, and a flying UFO. The UFO occasionally shoots a beam. The player needs to get the alien inside it so it can enter the spaceship. If done so, the game is won. However, if the time runs out and the alien is still on the ground, the player loses the game. 1st level difficulty: The beam is large. 2nd level difficulty: The beam is a bit shorter. 3rd level difficulty: The beam is shorter. This page was last edited on September 27, 2018, at 18:39.